Who are Les Habitants du Petit Fort? 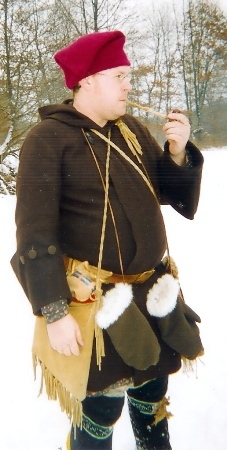 Some Habitants while on Campaign during the winter near Fort Carillon. 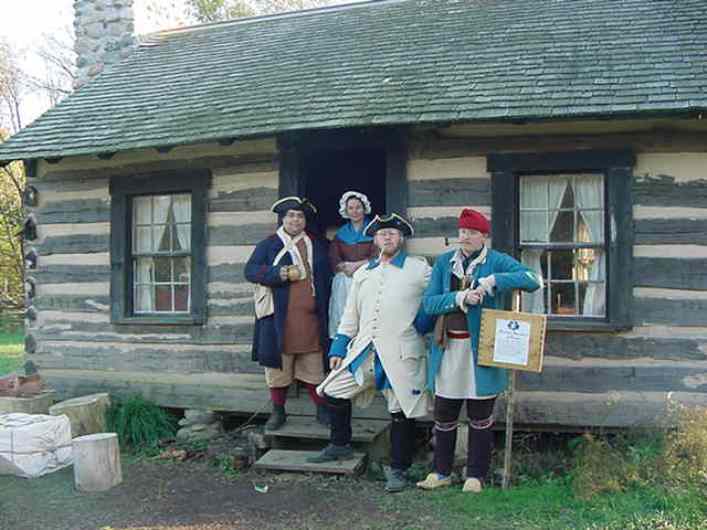 Members of Les Habitants du Petit Fort portray both the average and the unique inhabitants of the North West Indiana area around 1755. This includes civilian, military, militia, clergy and Native American impressions. A word about Les Habitants du Petit Fort. “le Petit Fort” was not the real name of the building erected in Northwest Indiana during the 18th century. This was a name subscribed to the building long after its inhabitants had abandoned the post. The name has been adopted by the group because this is the only documented name of the structure as written by Major Arent S. De Peyster in 1781. To be entirely historically accurate, the military group Milice du Petit Fort did not exist. If the French inhabitants of Northwest Indiana had joined the militia during the French and Indian War (there is no evidence for or against this idea), they would have enlisted at Fort St. Joseph, and rather would have been part of the Milice de Ste. Joseph. The name has simply been retained to refer specifically to those living in the area of le Petit Fort. 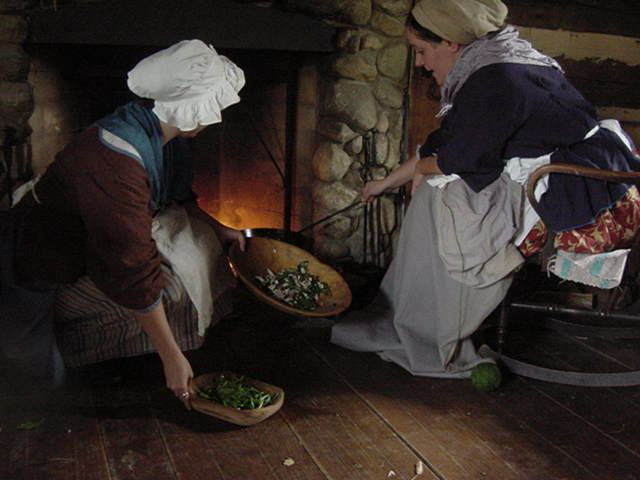 Who Lived In Indiana in the 1750's? In 1682 the Chevalier de La Salle laid claim to the Mississippi river and all of its tributaries for the King of France. This claim included the land which is currently North West Indiana. Soon European settlers, missionaries and traders began moving into this new track of land now under Frances control. Ten years after La Salle's expedition a Jesuit mission was built in present day Niles, Michigan and soon a military post was constructed to protect this post. Then in 1717 another trading post was established by the French on the banks of the Wabash in present day La Fayette, Indiana and in 1732 in present day Vincennes, Indiana. The region was now solidly under French influence, though the area was still considered the "Frontier" of New France. The people living in this area would have been a mix of French traders, trappers, settlers, clergy and military. In addition these Europeans would have shared the land with several Native Indian allies whom they traded and lived with and among. These tribes included the Potawatomie, Wea, Ojibwa, and Miami. The Brigade incorporates members of Le Petit Fort militia, as well as Regular French military units of the period. Les Habitants du Petit Fort is a member of The Brigade de Levis. The Brigade is umbrella organization which includes all facets of portrayals of 17th century life. The primary purpose of the Brigade is to portray and demonstrate the military forces of King Louis XV in the 1750's. The Brigade includes individuals who portray members of the regular French land forces, the Troupes de Terre, members of the Compagnie Francais de la Marine, the independent companies of the marine, and various Milice and Sauvage allies, French militia and Native American forces. Les Habitants du Petit Fort works in conjunction with The Brigade de Levis and all members of the Habitants are also members of the Brigade. When engaging in military battle reenactments the Milice du Petit Fort falls under the command of the officers of The Brigade. Page Last Updated on Questions or Comments?? ?